Are you looking for an original idea for vintage wedding favors? Well I’ve got the perfect tutorial for you. 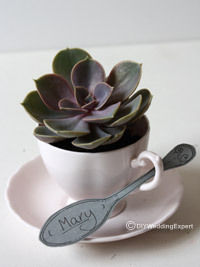 This step-by-step project shows you how to use plants in cups and saucer to make perfect vintage wedding favors. If you used odd and different patterned cups and saucers they will make wonderful a table decorations as well as being your wedding favors. 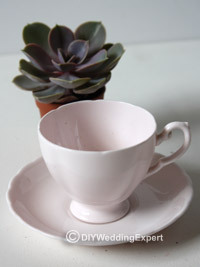 You will need an assortment of old fashioned vintage style cups and saucers. I got mine from an auction sale that sold odd boxes of pots for very inexpensive prices. 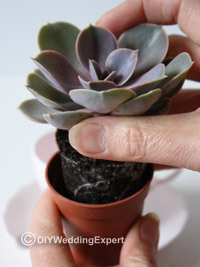 Minature plants like these succulent plants and a small amount of compost. 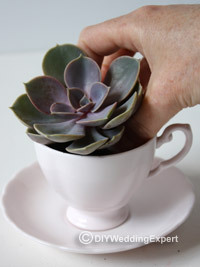 Gently remove the plant from its pot. I’ve chosen to use a miniature succulent plant but you could use any that fit in with the season of your wedding, or wedding color theme. 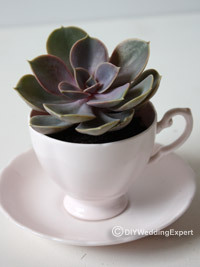 Plant into your chosen cups and saucers, adding more compost if needed. Add a place setting card. 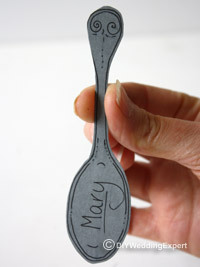 I simply drew an outline of a teaspoon onto silver grey card and cut it out. To make lots of these at once simply draw the image several times on a piece of paper and photocopy it onto your card. Then hand write in the names. Now you not only have your vintage wedding favors but also your place setting cards and they will certainly decorate the tables as well.